The Quebec student strike shook the province and had reverberations across the country as it became one of the largest - and most successful - social movements in recent Canadian history. 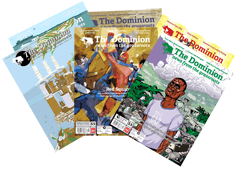 This image, used as the cover of issue 84 of The Dominion, is from Artact QC. Several thousand people took to Vancouver's streets in February to remember missing and murdered Indigenous women. 2012 also saw the release, to much critique, of the official inquiry report into missing and murdered women in BC. Photo: murray bush - flux photo. As 2012 closed out, Idle No More gained steam. In this photo, members of Aamjiwnaang First Nation held a blockade of a CN rail line for over a week, several days before lifting it under threat of a court injunction. Photo: Brett Rhyno. In Toronto, 2012 kicked off with a victory for popular mobilization and a defeat for Rob Ford's service-slashing budget. Montreal faced its first police homicide, with the killing of Farshad Mohammadi, a Kurdish immigrant from Iran who had been coping with post-traumatic stress disorder. An insightful story on the growing number of organizations that refuse to respond to questions from the Canadian Security and Intelligence Serivce (CSIS) shone a light on Canadians' rights in dealing with CSIS's tactics. In Nova Scotia, residents have long been accustomed to Nova Scotia Power's—and parent company Emera's—high rates and unsustainable use of coal-fired energy. In the first of an ongoing series, the Halifax Media Co-op dug into Emera's questionable dealings on the island of Grand Bahama, where skyrocketing prices and destructive power surges have left residents scrambling for electricity. Dominion writer Frédéric Dubois discovered that a vaunted part of Quebec's Plan Nord was another case of public costs for private profit. Foreshadowing a spring and summer of unrest, the city of Montreal began to feel the effects of major protests, including a blockade of the stock exchange against the privatization of public services, and the beginning of what would be a months-long student strike. In Nova Scotia, the ongoing environmental catastrophe of Boat Harbour raised the question of environmental racism, as runoff from a local pulp and paper mill continued to flow into the backyard of the Pictou Landing First Nation (and has been for the past 45 years). The Dominion's February investigative feature shed light on the working conditions at Canada's meat-packing plants. In Vancouver, a town hall meeting challenging gentrification in Vancouver's Downtown East Side saw a confrontation with restaurateur and developer Mark Brand of Save-on-Meats fame. The voices of the four Afghan women killed in the Shafia family murder were given centre-stage in a touching piece from Arash Azizi. Haitian photojournalist and Dominion contributor Jean Ristil Jean Baptiste died. Ristil, who suffered massive personal loss during the earthquake of 2010, was "one of the unsung heroes of the Haitian press" who "survived shootings, beatings and arrests to show Cité Soleil to the rest of the world," according to US journalist Kevin Pina. Dawn Paley reported on the continuous fight that the residents of San José del Progreso were waging against Fortuna Silver's gold and silver project, after years of protest and violence from pro-mine parties. An exposé put Canada's prison system under the microscope, examining the changes in Canadian criminal law that is opening the door for a private-prison industry based on growing inmate populations, less federal funding and dropping prison labour wages. With exclusive access to Freedom of Information documents, The Dominion featured the story of Wally Fowler, an African-Nova Scotian who was exposed to years of racism in the Canadian military, and a potential cover-up of his treatment by top military brass. Undercover police tactics, including using intimate relationships to gather information, were questioned. 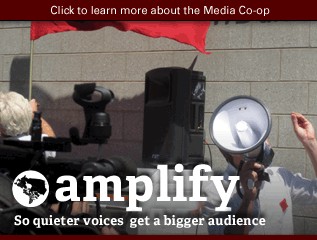 The Toronto Media Co-op exposed police brutality against activists. 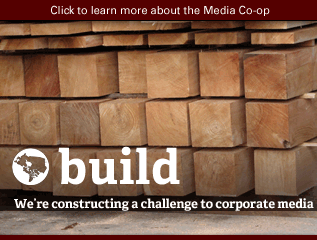 The Vancouver Media Co-op reported on the Musqueam nation, as an occupation began on the site of a proposed condo development slated to be built on an ancient burial site. In Montreal, 200,000 came out to the first major protest of the Quebec student strike against tuition fee hikes, making it one of the largest demonstrations in Canadian history. 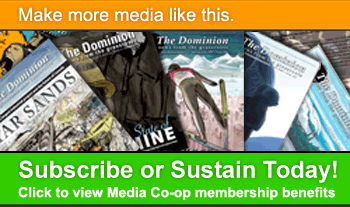 The Dominion examined the importance of recovering Indigenous languages, and the Vancouver Media Co-op covered the increasing number of rallies against pipelines and tankers off the Canadian west coast. Across Canada, refugee rights activists occupied MP offices to protest Bill C-31, the “Refugee Exclusion Act”. Reporter Tim Groves revealed that a new police weapon, a sonic canon, was rushed through the approval process for use on protestors at the 2010 G8-G20 summits. The Vancouver police made plans to avoid a repeat of the 2011 Canucks Riot by decentralizing potential celebrations turned sour. The Quebec student strike hit week 11, with thousands in the streets and the government blocking negotiations. Long-time gay rights activist and Media Co-op member Raymond Taavel was murdered in Halifax as he tried to break up a late-night altercation. The next day, more than 1,000 people poured onto Gottingen Street to mourn his passing. Sandra Cuffe asked whether enough attention was being paid to the Residential School Truth and Reconciliation Commission as it crossed the country with marginal interest from the Canadian public. With deep cuts to the environment that have become synonymous with the Harper Government, Sheldon Birnie explored an otherwise overlooked victim of austerity: the cuts to Library and Archives Canada. Popular support turned against the Quebec Liberals after they voted in a draconian anti-protest law. And while radical student unions in Quebec began to unsettle the power structure, an open letter questioned whether the Canadian Federation of Students was radical enough in representing the rest of Canada's student population. In Vancouver, the Musqueam re-occupied a condo construction site after traditional graves were desecrated, while in Southern Ontario Six Nations fought a new Samsung wind-energy project. As mainstream media continued to focus on violent clashes between students and police—symptoms, rather than causes of the issue—the Media Co-op featured 10 facts everyone should know about the Quebec student strike. 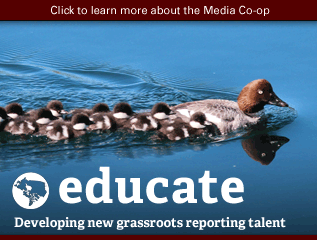 The Media Co-op also dissected the Harper Government's omnibus Bill C-38, a precursor to Bill C-45, providing readers with 10 reasons to oppose the bill. Halifax led the national charge against Harper's recently announced cuts to the CCAY (Cultural Connections for Aboriginal Youth), and public outrage eventually forced a rare about-face from the Conservatives as funding was "unfrozen." 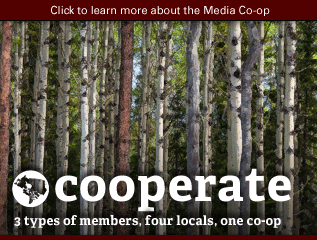 From the southern hemisphere, the Media Co-op brought you news on struggles against Canadian mines in Colombia, and Canadian foreign policy in post-coup Honduras. The failings of health care for Indigenous youth was exposed in Pictou Landing, Nova Scotia, as Jeremy Beadle's case was reported in a legal series from Moira Peters. The BC government was forced to respond to the Musqueam occupation in Vancouver, and permanently halted condo construction on the ancient burial grounds. Reporter Jesse Grass exposed pink-washing in the tar sands, as oil barons used gay rights as a mask for an environmental disaster. Alex Hundert, of the G20 "conspiracy" was sentenced to 13.5 months, the second-longest G20-related jail time. As solidarity rallies supporting the Quebec student strike sprung up, police across the country cracked down. Indigenous resistance to industrial pillage without consultation heated up in July, as the Algonquin of Barriere Lake fought against corporate logging, northern Inuit pushed for a say in uranium mining, and mining opposition grew in Ontario's Ring of Fire. Dawn Paley told a tale of Canadian support for permanent war in Mexico, while a quick coup hit Paraguay as Canadian corporations fell over each other to acknowledge the business-friendly coup government. Thousands participated in an hemispheric day of protest against Canadian mining. Toronto Media Co-op's Megan Kinch dissected class-war in the dystopian Dark Knight Rises. 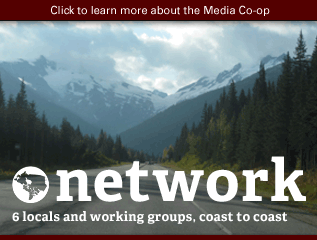 The Vancouver Media Co-op reported on a US placement company looking for tens of thousands to work on oil pipelines. Nova Scotia's Emera finally got busted in the Bahamas, as a external audit confirmed what anti-Emera action groups had been claiming all along. The new Convention Centre consultations in Halifax got panned, and Nour Awad shared her thoughts on being an hijab-wearing Haligonian. Indigenous elders and activists gathered to protest nuclear waste in northern Saskatchewan, while writers D'Arcy Hande and Mark Bigland-Pritchard exposed the hypocrisy of the nuclear industry trying to pass itself off as having a greening effect on Canada's tar sands. 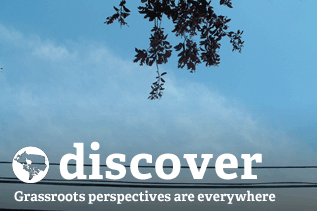 An Uni'sto'ten Action Camp against oil pipelines was established in northern BC, while Vancity credit union members scored a divestment victory against Enbridge. Stefan Cristoff found austerity cuts and police repression at the roots of Quebec's social unrest, while Luca Palladino proposed three ways that the Quebec government could find the money necessary to keep tuition fees frozen. Dawn Paley explored how the Harper government's new crime laws will handily lead to more prisoners for an increasing number of prisons. 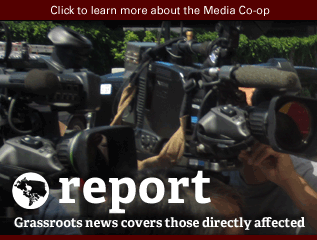 The Toronto Media Co-op reported on the destruction by vandalism of a free community garden, popularly used by recent immigrants. Geordie Gwalgen Dent did the math, and showed how Occupy saved the city nearly $100,000. In Cape Breton, increasing resistance to oil and gas exploration on the shores of the Nova Scotia's largest freshwater lake eventually saw industry recoil due to the hostile climate of Indigenous and non-Indigenous activism. We asked why Newfoundland and Labrador politicians voted to make government information even more secret, and exposed the mystery of the RCMP asking for the late Wiebo Ludwig's fingerprints. The Quebec student strike ousted the Charest government, and eventually stopped as the new provincial government promised to freeze fees for another year. Tim Groves revealed secret intelligence meetings between government officials and energy companies, where information concerning environmentalists and Indigenous activists may have been freely shared. Murray Bush and Isaac Oommen looked back on the 10 years since the Woodwards squat in Vancouver's Downtown East Side. Hundreds held vigils across the country to remember missing and murdered Indigenous women, while Saskatoon rallied against a Tory MP's boast of cuts to refugee healthcare. Residents of Toronto's George Street spoke out about devastating fires in their neighbourhood and the Toronto Media Co-op investigated Greek fascists setting up shop in their city. Enbridge pushed forward on its Line 9 pipeline reversal to send bitumen from Alberta to the East Coast, while the fight against nuclear waste in the prairies gained steam. If BC can't handle sinking ferries, how will the province handle oil super-tankers, asked Erin Empey in our latest investigative feature. Ann Hansen of the Squamish Five revealed her recent arrest in an exclusive statement. Israel launched a new attack on Gaza; thousands of Canadians stood in solidarity with Palestinians while the Harper government stood with Netanyahu. Guatemalans came to Canada seeking justice in the murders of anti-mining activists. Pipeline surveyors were ordered off of unceded Wet'suwet'en land. An ex-student strike spokesperson was found guilty of contempt of court for voicing support for picket lines. Mandy Hiscocks, one of the so-called "G20 ringleaders," was released from jail; shortly before she filed a human rights application against the Ontario Ministry of Community Safety and Correctional Services and the Vanier Centre for Women, alleging discrimination in the decision whether or not to place prisoners in maximum security. In Toronto, Rob Ford's austerity agenda was dealt a major blow after a judge declared his seat vacant in a ruling on a conflict of interest case. Greenpeace left the Canadian Boreal Forest Agreement. The fight against Ontario anti-strike legislation being wielded against teachers heated up. The United Nations' COP 18 climate change negotiations were undermined by fossil fuel corporations, reported Crystel Hajjar from Doha. Idle No More swept the country with round dances, rallies, railway blockades and support for Chief Theresa Spence, who embarked on a hunger strike to bring awareness to the Harper government's attacks on First Nations. A pan-Canadian coalition to defeat Harper was announced. 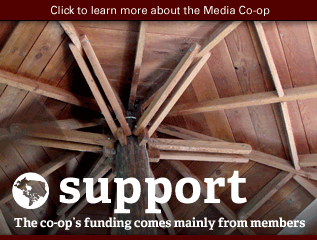 A small town cinema was saved by a co-operative. Ashley Fortier examined how HIV-positive people are becoming further criminalized. Simon van Vliet wrote about the push to hold police more accountable for violent actions.